Visit our showroom in Bedfordshire and you’ll discover a wide range of products with a friendly, professional service. When it comes to purchasing a new conservatory for your home, it really helps to be able to see the different roof and glazing options you have in person. That’s why we have recently opened a brand-new showroom for members of the public. 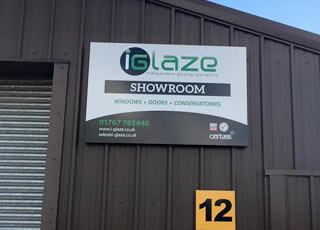 Here at iGlaze, you will find the expert advice you need from friendly, professional staff to help you understand what your options are in terms of both product and service. Our showroom has on display a state-of-the-art skyroom (glazed extension), a bi-folding aluminium door, composite doors, roof lanterns, PVCu windows, sash windows and much more. Our showroom is fully-staffed and we will be on hand to answer all your questions. Our showroom is in Sandy, Bedfordshire. You will find us just 10 minutes from the A1, with the quickest direct route from there being on the B1042 (Bedford Road). Why not contact us for advice or help with your conservatory requirements, we are happy to help and always offer a free, no obligation quote. we’re always happy to help! – We look forward to meeting you soon!